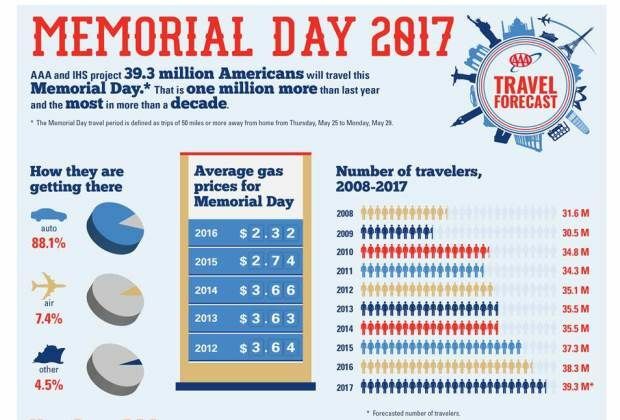 It’s the sixth consecutive year that the number of Memorial Day travelers has grown compared to the previous year. This year will have the largest number of Memorial Day travelers since the all-time record of 3.2 million in the Southland and 5.18 million statewide, which was set in 2005. Among Southern California travelers, 2.52 million are expected to travel by car - a 2.9 percent increase from last year’s 2.45 million going by auto and a number representing about 84 percent of all travelers. Another 300,000 local residents are expected to go by plane, which is a 6.2 percent increase over the 2016 holiday’s 282,000 air travelers. And about 197,000 local travelers will take a recreational vehicle, cruise, bus, train, or other mode of trip this weekend – a 4.9 percent increase from the 188,000 who traveled by other means in 2016. Statewide, about 84 percent of travelers, or 4.08 million, are expected to go by car, a 2.9 percent increase over 2016. About 485,000 statewide are projected to fly, a 6.2 percent increase from last year, and 456,000 will go by other means, a 4.9 percent increase from 2016. The Auto Club defines a holiday trip as one at least 50 miles away from home, and the Memorial Day holiday travel period is defined as Thursday, May 25 to Monday, May 29. “One significant trend we are seeing this year is solid growth in the number of air travelers, which also tends to signify longer vacations that are a greater distance away from home,” said Filomena Andre, the Auto Club’s vice president for travel. Nationally, travel is expected to increase by 2.7 percent compared to last year’s Memorial Day holiday, with 39.29 million travelers expected compared to 38.27 million in 2015. Car travel is expected to rise by 2.4 percent to 34.6 million, while air travel is expected to rise 5.5 percent this year to 2.9 million, and other modes of travel will increase by 2.9 percent to 1.75 million. Local gas prices are expected to hold steady near $3 a gallon on average – the second cheapest price averages for this time of year since 2009. The Auto Club recommends that summer air travelers allow extra time both to arrive at the airport and get through security lines, particularly if they are flying out of Los Angeles International Airport. LAX moved 15 airlines to different terminals in mid-May, which may cause additional traffic congestion throughout the summer. Also, travelers to Europe should be aware that U.S. officials are considering banning laptop computers as carry-on luggage on flights from Europe into the U.S., and they should check for the latest updates and with their individual airlines for complete details on carry-on policies. Memorial Day travel projections are based on research conducted for AAA by IHS Global Insight.